So are most people that are using OctoPi, disconnecting the touch screen? For me there’s no good reason to disconnect it. I still need the touch screen to change filament and level the bed. I was not suggesting to remove the touch screen permanently. I just did it as a troubleshooting step to prove to myself that there was a conflict between OctoPrint and the touch screen. So I’ve been using OctoPi for the past 3 days now with no disconnect issues. Not sure why the issues have gone away but so far so good. Thanks all for your help. I don’t have my SnapMaker yet but I’m ready to rock and roll when it does show up. It seem like OctoPrint doesn’t want to import cura settings. Anyone had a problem there? Also, doesn’t want to WiFi, anyone done any debugging in that department? @Tone I use the Pi camera (v1 since that’s what i had from an old project). It’s nice and compact. 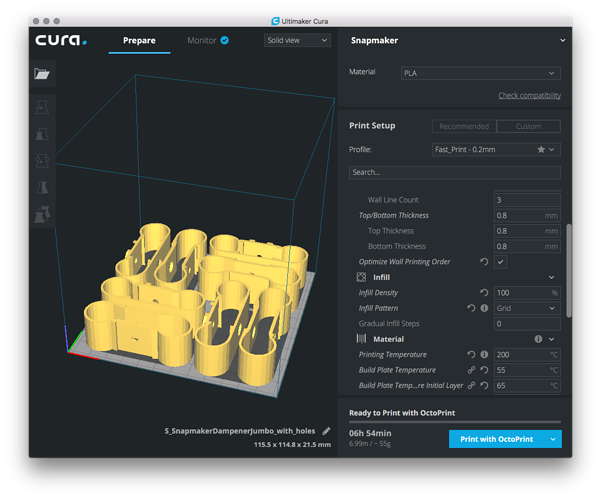 I can’t help you on the Cura settings since I do my slicing on Cura on the desktop. BTW, my Pi is connected to the network via ethernet port for an easier setup. Below are some screenshots of my setup from an overnight print I did. Pi camera and holder. It can swivel from the front of the bed to the right side. I can send the gcode straight to OctoPi from inside Cura. 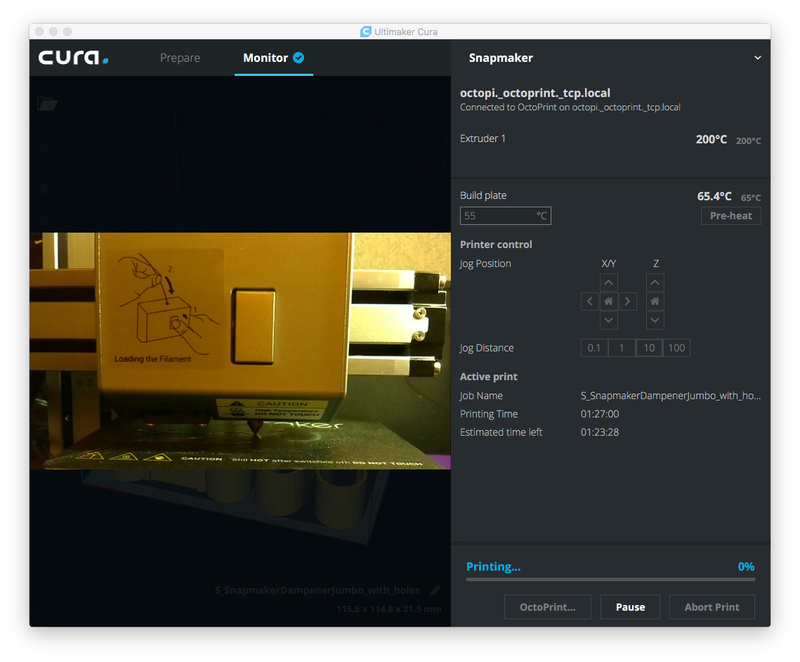 You can see your progress from within Cura if you like, or remotely from the web portal. That’s a great camera holder, did you design it? Is it on Thingiverse? I’m currently using a Xbox 360 camera but would love something better. Have you found the dampeners do reduce noise due to vibration? Does your printer move while printing or is there something on the bottom to prevent that. yes, that’s a custom camera holder that I designed/remixed. I just need to find time to upload the files to Thingiverse. Regarding the dampers, they do indeed reduce the noise due to vibrations. They are bolted on to the feet of the Snapmaker. The printer shakes a little while printing (noticed the top of the z-axis move slightly), but it does not move around. I did not put any padding on the bottom of the dampers although that might be a good idea. 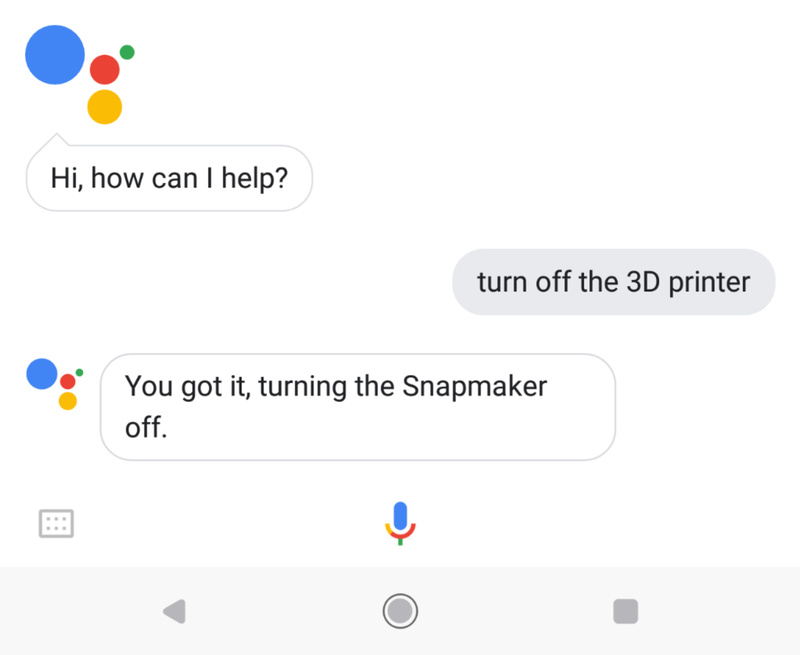 BTW, after the print is done, I was able to turn off my printer at home from work via Google Assistant. Now to build a robot arm to clear the print bed so i can remotely start another print. LOL. I also added the link on the SnapLinks page. They had the answer to my WiFi problem. Using a smart plug is only list of things to do. I’m just waiting because I need a permanent home for the Snapmaker. I have tons of smart devices at this point, my wife would argue that I have to many but I don’t think so… only have 90 . I like the idea of a robotic arm. Haha. I have thought about what’s the best way to keep printing one job after another; the robotic arm sounds like a solid idea. lol. @fio316a BTW I’ve published my camera holder on Thingiverse. 90?! So what’s one more for the Snapmaker? Another way to keep printing is by having a long rolling bed that just rolls to an empty spot once a print is done. Not sure how that works with the type of printer where the bed moves in the y-axis like the Snapmaker though. Back to the drawing board. Lol. When a print is underway, what happens if you type a command into the Terminal Tab? Does it queue up the command for later or does it try to execute it immediately? Or have you only used the Terminal Tab to view the GCODE as it scrolls by? Another way to keep printing is by having a long rolling bed that just rolls to an empty spot once a print is done. I was thinking about that a little, maybe a special bed could be built that is like a conveyor belt, once a print is done, the belt rolls the part off into the finished box! It might be a little tricky to have the heater just below the bed material and it would obviously have to be flexible enough to roll around the end rollers. The rolling action would have the natural effect of separating the part from the surface at the roller. I have not tried any of those features. I do not usually got into that tab. I stop at GCODE viewer tab. LOL. So I initiated a print through OctoPrint and at first I didn’t notice that the file I selected was on the SD card in the SnapMaker controller (which it apparently shows at the top level of the OctoPrint File list). So after doing that the OctoPrint kind of lost contact with the controller and eventually timed out. The print proceeded as thought it was initiated through the touch pad. I’m guessing that the controller just kind of took over as thought you had selected the file through the touch panel. Anyone else see something like that? I’m going to try one again and see if OctoPrint functions get suspended. That’s an interesting observation. I am using the USB port to power my OctoPi while connecting the other USB port to connect to OctoPi. By setting up my OctoPi this way I Inadvertently avoided confusing the source of the print. OctoPi is the only way to print to the printer. I was having the same issue, but once I lost connectivity, I would have no control at all and would have to shut off the printer to stop a print. I end up getting a shorter USB cable, replacing the one that came with the Snapmaker. This seemed to make it more reliable and I haven’t had connectivity issues. I got my Octopi configured this evening. WiFi works, so I’m able to get to the web page. Now I’m not sure what to do. Can Snapmaker3D be used or do I have to go to another slicer like Cura? 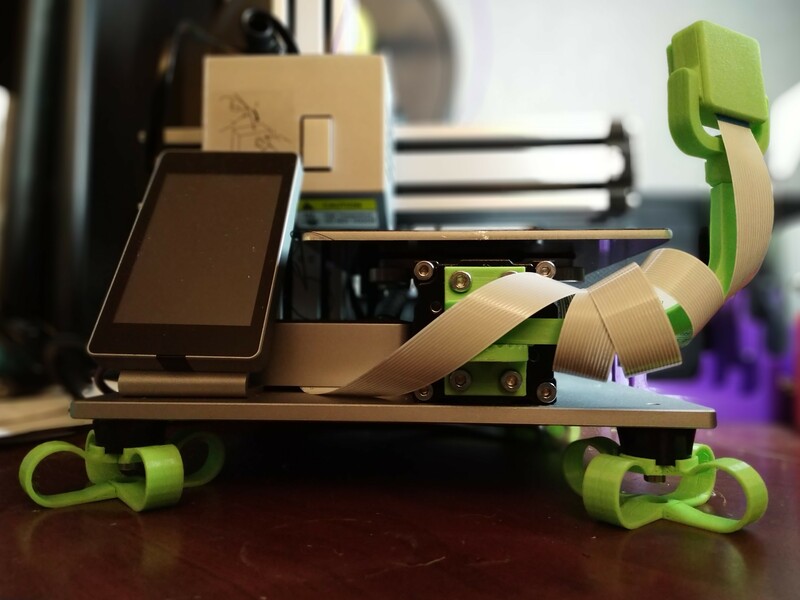 Are the instructions for getting other slicers working with Octoprint clear?